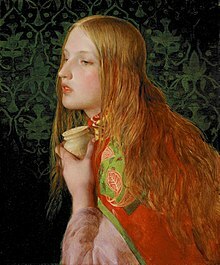 Mary Magdalene, the saint responsible for the popularity of the name Madeleine, in a painting by Frederick Sandys. "from Magdala", "tower", "elevated, great, magnificent"
Madeleine is a feminine given name. It is a form of Magdalene, well known because of Mary Magdalene. In the United States, this name often appears under the spelling Madeline. Madeleine and Madeline are forms of Magdalene, which is well known as a name because of Mary Magdalene. Magdalene means "from Magdala". Mary Magdalene's name is thought to be derived from Magdala – a village on the sea of Galilee. In Aramaic, "magdala" means "tower" or "elevated, great, magnificent". Additionally, in German, Mädelein means "little girl". Madeline is a popular girls' name. It is the usual North American English spelling of the French Madeleine, the French spelling being generally preferred in Britain. It has ranked as one of the 100 most popular girls' names in the United States for the past decade. For baby girls born in the United States in 2007, Madeline was the 61st most popular name, while its spelling variant Madelyn was ranked as the 104th, Madeleine was ranked as the 290th, and Magdalena was ranked 867th. Madeline was the 85th most popular name given to girls born in British Columbia, Canada in 2005 and the 93rd most popular name for girls born in New South Wales, Australia in 2007. Madeleine was the 80th most popular name given to girls born in England and Wales in 2007. A common shortened version of the name is Maddy, Maddie or Len. Madeleine Lartessuti (1478-1543), French shipper and banker.